If you have enjoyed this blog in the past. Please check out my new internet broadcast “Mysterious Disappearances” on facebook. There you will find the show on various forms including ITunes and Stitcher. UPDATE: SUNDAY, APRIL 25TH. AUBREY HAS BEEN FOUND SAFE! No details have been given at this time. Tonight, I want to bring attention missing persons tale of Aubrey Moss from Tacoma, Washington. Aubrey disappeared on April 10th and not much is known about her whereabouts on that day. Aubrey age 20 was last seen wearing black yoga pants with a pink vest and flip-flops. She has tattoos of roman numerals on her neck and arrows on her wrists. Her friends describe her as vivacious and glamorous. She also has her nose pierced and usually has a hoop in it. Last night, I did contact Tacoma PD with information about a twitter account with her name and picture with the location being LA, California. It turned out to be her account that she used while she spent time in California. All of her social media accounts have been silent since her disappearance. No activity on her cell phone either. She has no history of being a “runaway”. The main reason I want to bring attention to this case as it continues to unfold is because I feel much can be learned from what is transpiring on social media regarding her disappearance. Many people are bombarding the family with lifestyle questions about this young lady. I believe that is wrong. If you are the type of persons who shares missing persons fliers through social media- THANK YOU! You are doing a great service to the public. However, trying to ask questions to pry into a missing person’s life in the infancy of a disappearance is a real nuisance. Believe me families of the missing are going through enough without having to deal with that. The only people who should be concerned with this young lady’s lifestyle choices at this point are trained investigators. I find often in cases family and friends hide bad lifestyle choices from both the public and investigators that their missing loved one has engaged in. IT IS IMPERATIVE THAT THE FAMILIES OF MISSING LOVED ONES TELL AUTHORITIES ANY LIFESTYLE CHOICES THAT MAY HAVE RESULTED IN THE DISAPPEARANCE. WHETHER IT BE CRIMINAL ONES OR OTHERS. Unfortunately though, when the public presses for these answers directly and immediately it causes harm to the family. The family has to spend precious time defending their loved one. Sadly, that seems to be unfolding in this case. The press and “reporters” from sites where virtually anyone can be a reporter do that all the time. They do it enough without the general public engaging in it. Some seem to enjoy digging up dirt on a missing person more than printing useful information to find them. It can be rather disgusting to see. As the search for this missing young lady continues I will continue to update her story right here. 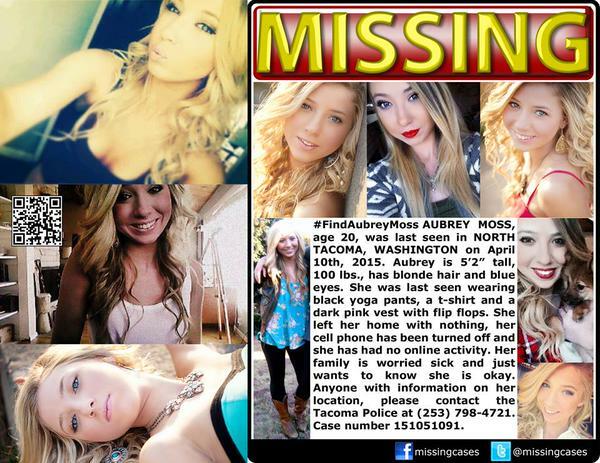 Please share her poster which can be found on the facebook site: HELP FIND AUBREY MOSS. If you have any information on Aubrey’s whereabouts please dial 911 or call the Tacoma Police at (253) 798-4721. Frank “Ray” Gricar was DA of Centre County Pennsylvania when he went missing on April 15, 2005. The story of his disappearance re-appeared during the Jerry Sandusky child sexual abuse scandal that rocked the county in 2011. When I first began to blog about the case it was clear. Most people seemed to think Gricar was a homicide victim. The word on the street was that Gricar was done in by any number of enemies. There was the possibility he was murdered to cover up a future Sandusky indictment. The possibility a heroin ring busted could have gotten revenge. Strange rumors about a motorcycle gang killing him. Maybe he was killed for the information on his lap top computer? There was no shortage of theories pointing to disappearance as the result of a criminal act. But could I uncover evidence to support those theories? I would be looking at three different scenarios here. Disappearance as the result of a criminal act. Disappearance as the result of a suicide. A disappearance planned by Gricar of his own doing. Who was Ray Gricar? That is first question I had on my mind. What was his behavior like? What kind of person is he? What skeletons if any does he have in his closet? People connected to Gricar who spoke to me said that he was a consummate professional. He was a ladies man type of figure. He did not do drugs. He did not gamble. A person who worked with Gricar did blog at length about how he was a very private person. He did knock off work for the day every once in a while. Not one person I spoke to indicated ANY type of inappropriateness in his conduct. He was very proud of his Slovenian heritage. His heritage was a very important thing to him. It certainly did not seem that Gricar was center stage in the Centre County nightlife either. No one reports seeing him out much in social scenes. He had a law school education with a minor in Russian history. No one reports any sign of mental illness or depression. As I looked into whether or not Gricar would be the type of guy to look the other way over certain bad behaviors the answer became a resounding “NO!” In various press outlets, girlfriend Patty Fornicola reports Ray seemed to be sleeping frequently prior to him disappearing. Sleeping could be a sign of stress. What would Gricar be so stressed over? He was about to retire. So what do I write on the big white board so far? ***Ray Gricar was a very private man who was the consummate professional at work. He did not have any real bad habits. He didn’t gamble or do drugs. He graduated law school with a minor in Russian history. He was proud of his Slovenian heritage. Next it’s time to find out what were Gricar’s actions on the day he disappeared. On the day Gricar disappears, he calls off work. He changes plans he had to go to work to instead stay home. Ok, this is important. Anyone planning to murder Gricar with premeditation has just been thrown a major curveball. How would they know where Ray Gricar is going to be since he changed his plans?? ***Ray Gricar called off work the day he disappeared. Ray leaves his place of residence in a newer red Mini Cooper. It is extremely important to note that the Mini is not owned by Gricar. I was abled to determine it was actually owned by Ray’s girlfriend Patricia Fornicola. It was in her name! ***The vehicle Ray leaves in- a red Mini Cooper is not actually “his”. From the time Gricar leaves his residence until his car is found in Lewisburg, PA. we are left to fill in some major blanks. There is a sighting of Gricar in the shop near where the Mini was parked with a “dark haired woman”. Gricar did not make any emergency calls. He did not call anyone that would lead authorities to believe he was meeting someone last-minute. A Former AD would claim to see Ray driving a different car that day. A source would come forward to me that she believes she saw Gricar with a woman in Lewisburg the day of his disappearance at a hotel. No source has ever come forward with CREDIBLE evidence they witnessed a crime or knew Gricar was the victim of a homicide. In fact many stories have been disproven. No calls to 911 in Lewisburg or other nearby cities exist claiming a person witnessing Gricar walking away from the area where the Mini was found or jumping from the near by bridge. A search of the river yielded no body. In suicide cases you are left with a body. No remains have ever been found in the river that have been unidentified either. Gricar’s cell phone would be locked in the car where it would be found. It was left there intentionally by someone. Much later, his laptop computer and subsequently it’s hard drive would both be found in the Susquehanna River close to where the Mini was parked. Reports from LE would confirm that Gricar’s home desktop computer would have searches on it dealing with “frying a laptop hard drive in water”. *** Ray Gricar’s laptop computer and hard drive were found in Susquehanna River. Searches on his computer reveal internet searches about destroying that lap top hard drive in “water”. Since the hard drive was destroyed in a manner consistent with the search results on his computer it is clear he did it himself… he did ask around about how to destroy the hard drive at work. His nephew Tony Gricar was a computer whizz. Why not reach out to him and find out how to do it? The chance of it being a coincidence that it was destroyed by someone else I would place at hitting a six digit lottery ticket. Think about it. It was destroyed in the EXACT manner of his own search query. What were the people being interviewed for television programs saying about the story? *** No crime scene. Nothing but the faint smell of tobacco in the Mini. No fingerprints or any type of evidence at the scene the Mini was left. ***A very well planned event. The DATELINE special included interviews with girlfriend Patricia Fornicola. In one interview she uses the words “soul mates” to describe her relationship with Ray. She explains that Ray planned to retire and they were going to drive across the country. Would you ever stop looking for answers to your soul mates disappearance?? Patricia did. So did Lara. And rather abruptly too I might add. In order to travel across the country you would need to have a different vehicle and of course money. Lots of money. Ok well, so what exactly were Gricar’s financials at the time of his disappearance? Public filings by Gricar’s family lawyer say that Gricar had under $25k in assets at the time he disappeared. Ray Gricar made over $120k a year as a district attorney. To me it seems odd. Where was all of this guys assets? Surely he had a saving account. He must have had some sort of IRA’s or stocks/bonds. He would have too, right? A phrase coined by the great Paul Harvey. ***The vehicle Ray leaves in a red Mini Cooper is not actually “his”. *** Ray Gricar’s laptop computer and hard drive were found in Susquehanna River. Searches on his desktop computer reveal internet searches about destroying that lap top hard drive in “water”. ***Ray Gricar had under $25k in assets the time he disappeared. Not one single thing I have uncovered at this point suggests a homicide. No suicide notes. No body in the river. Nothing here suggests suicide except perhaps his moods/behavior of being sleepy and seemingly “stressed out”. On the other hand, it sure does look like a planned event by Gricar. The digging didn’t end there. I kept digging. Maybe too deep. ***A source provided me with a copy of a document filed to a PA agency in 2014 with secretive language in regards to the Gricar case. The language in the document makes it clear it was not meant for public scrutiny and reveals that the only assets Gricar owned was a joint bank account with his daughter that had just over 1k in it. ***Family spokesperson Tony Gricar’s twitter handle has followers who speak Slovenian. He dealt in Etruscan Art at the time I researched him. After contacting him that account disappeared! He also has admitted to me via computer message that he knows people in the foreign intelligence field. He claims that I know 5% of the effort to find Ray. As of 2017, he moved from Ohio to Lancaster, PA to start up a computer business called Green Pro Marketing. He certainly was not friendly in my efforts. ***I interviewed a former defense contractor from Lancaster County who attended a FBI seminar in the late 1990’s which talked about Central PA being a very popular location for foreign intelligence agents. Specifically, Lancaster county. Suburban towns in most counties in Central PA would be a days drive from places like Philadelphia, Washington DC and New York. Communications by these agents may have been via computer but information is usually only exchanged in person to avoid getting caught. PSU has a program for intel officials. ***Gricar did travel in the past to what is the former Yugoslavia. ***Gricar’s brother Roy was found to have committed suicide by bridge jump in Ohio. Roy did work at a military base and I learned had several military clearances. Ray told others he wasn’t sure his brother really did commit suicide. Could Ray have been afraid it would be his end? Is there a connection between Roy’s suicide and Ray’s disappearance? *** A retired police sketch artist believes he saw Ray and a women in another state eating at coffee shop. (This sighting is just miles from the Macedonia foreign consulate.) Gricar was eligible for Slovenia citizenship. Both Macedonia and Slovenia are parts of what used to be Yugoslavia. ***The campaign to find Ray abruptly seemed to end. It was very odd to many that two nearby county prosecutors Ted McKnight and Bob Buehner spoke out vehemently about this case. They were highly critical of the investigation which to them seemed lacking any substance. Everyone has seemingly moved on. Even those two. No more interviews from the two closest to him. A story about this by the New York Daily News garnered many “NO COMMENTS”. ***Former Police Chief Shawn Weaver: “There is about a zero chance of a homicide in Lewisburg on that day”. ***There is no internet or facebook light that exists as of 6/2017 in this case to find answers. ***The FBI missing poster which can be found on there site mentioned aliases. Those aliases are his past wives maiden names. He used those names on financial records during his time with them instead of “Gricar”. ***A panel was convened by DA Stacy Parks Miller to find answers. It adjourned with no public statement. Just a recommendation to move this investigation from local authorities in Bellefonte to the Pennsylvania State Police in Holidaysburg, PA.
Ray Gricar, I believe was leading a double life. His long time assistant mentioned his life of privacy in her blog as well. It goes along with what I know to be true about his behavior. While interests from plenty of people have been generated since the PSU scandal about Gricar’s disappearance. I allege Gricar’s disappearance had nothing at all to do with the goings on at PSU. NO TIES TO THE SANDUSKY SITUATION EXIST. I believe if they had we would know about it by now. Furthermore, if the Sandusky situation had never made national attention I believe the story of Ray Gricar would have disappeared all together. I have looked at this and interviewed people from both sides of the coin. From the side Gricar was murdered to cover up exposing Jerry Sandusky’s behavior. To the side he may have actually been involved in some pedophilia ring I hear went on at PSU. No one has said anything nor could my research connect him to the goings on or enabling of bad behavior in ANY way. I can’t stress this enough. People who have spoken to me off the record tell me Gricar was “upset” at that time about the Sandusky claims. However, after interviewing the accuser at the time he could not file charges. (I was told he put Sandusky and the accuser in the same conference room then left the room to observe their behavior. The accuser’s behavior while left alone with Sandusky did not coincide with one who was a victim, I was told.) Likewise, to date… no one has come forward to say Gricar was involved in ANY wrongdoings there. We interviewed one former child prostitute who claims to have been brought to Central, PA from Philadelphia by a guy named Ed Savitz. He had no knowledge of Ray Gricar. I do not believe it is possible Gricar was murdered to conceal evidence on that laptop computer as others suggest. It would have been impossible for any criminal to know that whatever incriminating information Gricar may have had about them- that it was SOLELY on that computer. I instead point to the fact that Gricar searched his home computer to find ways to “destroy a laptop hard drive” as proof that no one else besides Ray Gricar threw both the hard drive and the computer in that river in the manner it was found. Leaving his phone behind left no way for him to be tracked. I believe enough circumstantial evidence exists to suggest Gricar staged his entire disappearance that day. He had the whole thing premeditated right down to the very date. His financials TELL US SO. No one making six figures a year disappears and leaves behind nothing without there being a connection. And make no mistake he left behind less than 2k in a joint bank account according to court documents. No retirement. No IRA’s. No PROPERTY. No way its a coincidence. I do not believe his loved ones were aware of his “secret”. I suspect that’s why he seemed tired about something just prior to his disappearance. He knew it was coming to the time he was going to have to leave friends and loved ones behind. An awfully stressful deal. How would you feel if you had decided to leave loved ones behind without telling them why? If Ray did leave of his own accord at some point down the road would he let that secret slip to the people he loved after the investigation died off? Why not polygraph Lara, Patty and Tony NOW. At this moment in time in 2017? Doesn’t that seem like a no brainer for investigators? It sure would seem so. The problem there is that the investigation into this elected officials disappearance has been dead for years. It has become a tip waiting game. No one is going over this and not even the press is interested in asking some people some hard questions. They are hundred of miles away so its too hard for them. But I am absolutely confident that this is NOT a mystery to some people. That’s why the light on this missing persons case has been turned off many many moons ago. Gricar bragged that during his last election he won without knocking on one single door. No one knocked on many doors looking for him. But I will not stop. No matter how ugly. The people of Centre county DESERVE answers to erase the cloud of having the only sitting DA in America disappear without a trace. A Pulitzer was won by a member of the media there for their work on this story. I wonder if the recycled stories are simply to protect that. Or are they really to blind to see that over the years one person consistently declines comment? One person tells one reporter “That’s none of your business.” One person pulled the plug on the internet site looking for Ray. If I am completely wrong and this isn’t a case where Ray’s sensitive connections sent him overseas…if this just happens to be one giant embarrassing situation gone wrong….or if its a case where he just had another relationship and flew the coop (IE: Tim Carney) THE PUBLIC DESERVES TO KNOW THAT RAY IS NO LONGER A MISSING PERSON! One of the strangest disappearances I have run across in the Fall of 2014 has been that of Kayelyn Louder of Murray, Utah. Kayelyn age 30, went missing from her apartment complex known as the “Willows” around 6pm Sept. 27th, 2014 after some of the most bizarre series of events imaginable. A former social worker, Louder has been described as a “quirky, compassionate, fun-loving” young women who was “loved by everyone who met her”. Prior to her disappearance it appeared she was expecting guests as she had cleaned her apartment. While authorities have a video tape of Louder walking out of her apartment in a white tank top with no shoes in a pouring cold rainstorm there are no signs of a crime for them to investigate at this point. In addition to having no shoes on Kayelyn did not have her wallet, car keys or cell phone. Witnesses have come forward to say they saw Kayelyn trying to open locked gates and cars. One thing I believe for certain: Kayelyn Louder did not simply walk away from her cherished pet pug and all the people who loved her to start anew. The search for Louder by family and friends has been intensive. In covering these stories, I have never seen a greater effort in the use of flyers, events and social media in any other case. It is a 24/7 effort by people to get information on this young lady out there. It is most certainly a model effort and everyone involved is to be commended. Let’s hope and pray that this young lady is found safe and please share her information with everyone you know. You can also go to the public Facebook page at: Find Kayelyn Louder- to learn how to help more. If nothing breaks on the case soon, I will start conducting interviews with people who know her. Citizens of the area tell me there are a number of missing persons cases going on there. One thing is for certain… we need to find this young lady FAST. With no clues as to her disappearance time is of the essence for sure. Despite recent searches to the area there are no leads that have led to Ms. Louder’s safe return. (801) 840-4000. If you would like to leave an anonymous tip (866) 660-4025. ***UPDATE– It is with heavy heart that I report that the body of Kayelyn Louder was found in the Jordan River on 12.01.14. The body was found near a drainage pipe. A creek from nearby her residence does feed into that river. With the last known sighting of Ms. Louder being seen outside in the pouring rain with no shoes and the strange calls to 911 in which authorities describe her as “delusional” we are left to wonder if indeed this is a homicide case, an accidental death case or a suicide. Hopefully, the Medical Examiner’s office will be able to provide her friends and family with some concrete answers. One thing is for certain… Friends family and strangers came together like I have never seen before to find this young lady. The amount of love in her heart that spread like wild fire throughout her community will no doubt be missed. I will continue to update this story as information becomes available. The effort by family and friends co-ordinated by cousin Amy Fugal should really be a model for what should happen to find a missing loved one. It has been quite extraordinary to follow. The results of the toxicology reports did not yield the answers this family was desperately seeking. The cause of death was ruled “undetermined” but it appears it is related to the elements and water. Since this young lady was found with no apparent signs of homicide I am left to conclude based on the circumstantial things we know- that she ran into the woods herself and it precipitated and accidental death. I can only speculate based on the police response to a call she made that she was not in her right mind for whatever reason prior to her disappearance. Quite frankly, I knew this was going to be the outcome for months. Whatever caused Kayelyn to act the way she did prior to her disappearance we may never know. Sadly, however this sweet soul met with a tragic end. What makes a person do this? In my experience studying these cases it can be prescription drugs, illegal drugs (which tests came back negative for), synthetic drugs or in some cases an onset of mental illness. I have learned last week that the DNA test on the remains believed to be Madyson Jamison has been completed. Law Enforcement is not releasing the report at this time. The website NamUs which is used by Law enforcement in these cases has also posted a picture on their website of an age progressed Madyson. The picture was made in Feb ’14. Leaving us yet again with way more questions than answers. If they thought the remains were hers why go through the motions of doing all this hard work to make up an age-progressed picture? ON JULY 3RD 2014, THE MEDICAL EXAMINER IN THE CASE POSITIVEY IDENTIFIED ALL THE REMAINS IN THIS CASE AS THAT OF THE JAMISON FAMILY. NO FOUL PLAY IS SUSPECTED IN THE CASE DESPITE RAMPANT SPECULATION OF MANY ON THE WEB. ALTHOUGH NO CAUSE OF DEATH WAS FOUND, INVESTIGATORS NOW BELIEVE THE JAMISONS SIMPLY GOT LOST IN THE THICK MOUNTAIN TERRAIN AND SUCCUMBED TO THE ELEMENTS. WHILE MANY MANY PEOPLE CLOSE TO THE CASE TOLD ME THEY BELIEVED THE JAMISON’S WALKED AWAY. SO MANY THAT IT CONVINCED ME TO BE TRUE. I HAVE ALWAYS HAD INFORMATION TO CONTACT BOTH THE POLICE AND NIKI SHENOLD AT THE BOTTOM OF MY BLOG. AS YOU WILL FIND OUT, I HAVE ALSO PASSED TIPS TO AUTHORITES AND PROVIDED A PERSON WHO BELIEVED THEY SAW THE JAMISONS WITH INFORMATION TO CONTACT AUTHORITES, WHICH THEY DID. I HAVE ABSOLUTELY NO REGRETS ABOUT TRYING TO STIR UP INFORMATION AND AWARENESS ON THIS CASE DESPITE THE HORRENDOUES OUTCOME AND CRITICISIMS ABOUT ME BY MS. SHENOLD AND OTHERS. Below was the age progressed picture of what Madyson Jamison would have looked like had she been alive today. Jan. 17th, 2014 would have been a very special day for Indiana University attendee Lauren Spierer. It would have marked the young ladies twenty-third birthday. The story of the disappearance of Lauren Spierer is a gut wrenching one for this blogger. 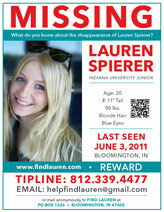 Lauren Spierer disappeared in the early morning hours of June 3, 2011 after a night out with friends. I have a really hard time typing the word “friends”. I have researched hundreds of missing persons cases and this particular case frustrates me to the point of breaking things. The reason being that I believe that at least one of her “friends” are just not telling authorities what all they know. Now this is the point I would go in-depth to tell you the story of this wonderfully vibrant young girl and the family who loves her. I would go into all the details of what happened the night of her disappearance in hopes the story might be read by someone who’s memory might be jogged. I would give you all the fine details leading up to her disappearance with my analysis on what certain facts may mean. But this case is not a big mystery. In fact it makes my blood boil more so than usual. It is especially nightmarish knowing that at least one of these “friends” know exactly what happened to Lauren. See this isn’t a missing person’s case where we all can debate theories. We know that some of the folks that were with Lauren at the time of her disappearance immediately hired high profile attorneys “lawyered up” and left town. They didn’t stick around long to search for her. They never utilized their social media accounts to help find her to this very day. They just got quiet. One even got defensive to a reporter about how his life was turned upside down by the event while never even mentioning Lauren’s name. Before I go off on a complete tirade about this case. I find in many cases that we don’t get the entire story about the behaviors of the missing from their loved ones. Most folks do what they can to maintain a positive image of their missing loved one. This case is no different in that aspect. People fear that their loved one will be seen as less than sympathetic if bad behaviors are exposed. Some go to great lengths to hide those behaviors. Some are just unaware they existed. I don’t want to discuss Lauren’s bad behaviors to upset her loved ones. Quite the contrary. It goes directly to the best piece of information I could give readers to avoid winding up in similar situations themselves. The night Lauren disappeared she was drinking underage with a fake ID at a bar. She was “partying” with several people she knew. She was by all accounts a “partyer”. Lots of young people are. Especially in your college years. But here is the most important thing to consider if you go out partying. DRUGS AND ALCOHOL IMPAIR YOUR ABILITY TO BE AWARE OF YOUR SURROUNDINGS. When you lose that ability and your judgment is blurry… you are MUCH more susceptable to being the victim of a criminal act. ESPECIALLY, if you are a good looking young vibrant petite blonde. That my friends is a fact worth remembering and if there is a lesson to be learned from this tragedy that is it. And that is exactly what we have here. A night that was suppose to be a fun night out with new friends partying in college turned into a tragic missing persons case. One in which authorities hands are tied because while they have a good idea who is involved they have no hard evidence to charge anyone in the case with any wrongdoing. The Spierer parents have pursued a civil lawsuit for wrongful death against some. Recently, an article surfaced by PI Bill Warner trying to connect a number of these cases together including Spierer’s based on the fact that the women were all petite blondes. They are not all directly connected. There is no serial killer on the loose involved in these cases in my opinion. At least not in this case. The Spieirer’s have done absolutely everything possible to bring home their daughter. They have hired a top PI firm. They have utilized the mainstream media, social media and the internet to keepthesearchalive for Lauren. Just take a look at this statement issued this past October on the Facebook page started dedicated to finding Lauren. To anyone who has information about Lauren’s disappearance, you CAN send an anonymous tip to the post office box. If you are ready to help us by sharing what you know, I implore you to do so by calling the tipline, by sending a private message via Facebook, by sending an email or by calling the private investigator. So what can we possibly do on Lauren’s birthday to help bring her home? We have decided that we are not going to sit back and allow the “quiet ones” to continue to get away with trying to erase the memories of what happened in Bloomington that night. That is what they have done. They have tried to erase memories from their brains and social media accounts of their relationship with Lauren and have hidden behind high profile attorneys. I guess in hopes that they will be able to continue on with their lives in some normal fashion. We are going to simply remind them of Lauren’s disappearance. For as long as it takes. You see…let me write this to you directly. Corey, I believe it has become easier for you in the short term. But I know every time you drink and party the memories creep back to haunt you. Oh you might be far from college now. You might think time will heal this for you. You might have even figured out a way to justify the whole thing in your head. But what are you going to do some day when you get older and have a child (perhaps a daughter)? The wisdom you gain about life as you mature will only make your secret haunt you worse. You are religious person. Do the right thing. Don’t let this secret corrode what is left of your soul. Lauren Spierer was living breathing beautiful young person. Try as you may to forget her. We don’t plan on letting you. I wonder since it seems you’re trying to distance yourself far from the situation if you even know that you’ve been given a golden ticket to clear your conscience? Do you even know about the PO Box? Whatever happened to Lauren that night it is time for someone to leave a tip. Its gone on for far too long now. For those who knew the people involved but are afraid to say anything. Don’t be. It’s time for you to come forward as well. Fans of this blog should run right over to http://mauramurray.blogspot.com/ Crime writer James Renner has done an outstanding job of trying to figure out what happened to Maura Murray. Murray disappeared mysteriously on Feb. 9th 2004. She was involved in a traffic accident and after telling a bus driver she was “ok”. She was never seen again. Many people have theorized she was the victim of foul play. We have donated $250 to Renner’s campaign to put up ads seeking information on her disappearance on it’s anniversary. Please click on the link to his blog above and watch this mystery unfold and support his work. We will be writing much more about her disappearance but will not impede Mr. Renner’s work on the case unless further details become available. 8/17/14 UPDATE: Recently in the kidnapping of Abigail Hernandez many wondered why the person arrested Nate Kibby 34, was charged off the bat with very low felony charges. Some wrongly speculated that Hernandez was a willing participant. I want to shed some light on the matter. Authorities do this to gain leverage over a suspect when they need to obtain additional information from the would be perp. In this case, I believe they did this to try to get Kibby who sources tell me is not talking to authorites- to talk. I certainly do not believe Hernandez was the first victim of this person rather his LAST. Could a then 24 yo Kibby have been involved in the disappearance of Maura Murray? Well, Hernandez was abducted from the side of the road. Murray was waiting along the side of the road when she disappeared. Would Murray, who wrecked yet another car and may have been drinking and driving have been vulnerable to a 24 yo kidnapper such as Kibby? Absolutely. More over, would Murray have gotten in a vehicle willingly with Kibby to avoid yet more trouble in her life? I certainly think so. The set of circumstances fit perfectly. Kibby most certainly should be questioned with Murray and other women’s disappearances. Let’s hope that investigators can get to the bottom of just how many and which women Kibby has victimized. Maybe some families can finally gain some closure on their disappeared loved ones.